South Carolina queen and bee breeder Dwight Porter will give a talk on raising queens for the hobbyist. NOTE: This meeting was canceled due to a snow storm. We are working to reschedule with Dwight for later in the spring. The Feb. 13 New River Valley Beekeepers Association meeting will feature the first in a series of speakers over the coming year, who will discuss methods for queen rearing, nucleus hive making and maintenance and other issues related to establishing more self-sufficient apiaries. 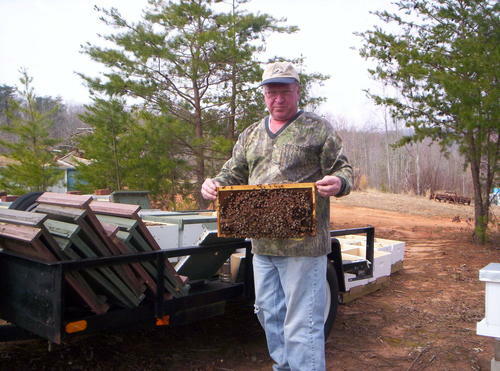 Join us at 6:30 p.m. at the Montgomery County Health and Human Services Building at 210 Pepper St., Christiansburg, where South Carolina-based Russian queen and bee breeder Dwight Porter will talk about his methods of queen rearing and give suggestions for how hobbyists can get started making small numbers of queens for themselves. We will also have our monthly beekeeper raffle, snacks and a “what should you be doing with your hives this month” discussion. This entry was posted in beekeeper education, meetings, NRVBA, speakers and tagged beekeeping, blacksburg, christiansburg, Dwight Porter, New River Valley Beekeepers Association, queen rearing, Russian honey bees. Bookmark the permalink.